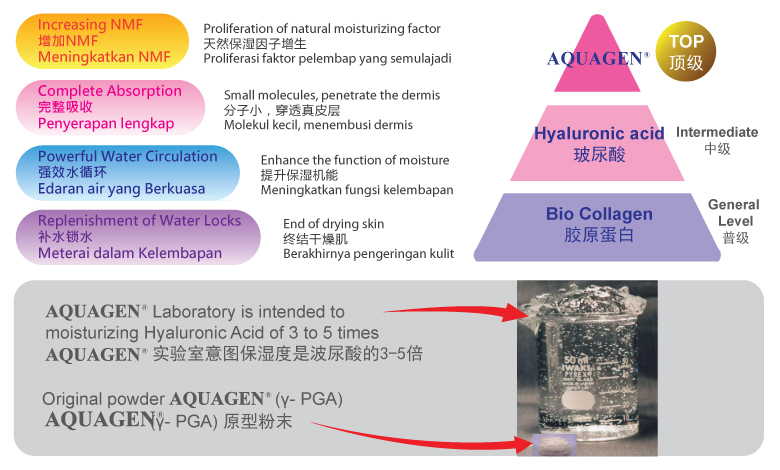 AQUAGEN ® for the high moisture ingredients, can be applied to any skin type, moisturizing effect of more than Hyaluronic Acid!! Unique ability of absorbing water and water lock provides multi-layer skin moisturizing and multiple protection. Infiltration of self-moisturizing effect can penetrate the stratum corneum, to maintain transparency and hydrated skin feeling. The skin natural moisturizing factor NMF in the natural production, improve skin dry conditions. Let skin care products long-lasting effect of other active ingredients make the skin absorb the extra function. A good compatibility features, extremely weak security mild skin. In the skin surface, forming a natural protective film barrier to the skin from outside pollution.